Total knee replacement, also called total knee arthroplasty, is a surgical procedure in which the worn out or damaged surfaces of the knee joint are removed and replaced with artificial parts. The knee is made up of the femur (thigh bone), the tibia (shin bone), and patella (kneecap). The meniscus, the soft cartilage between the femur and tibia, serves as a cushion and helps absorb shock during motion. Arthritis (inflammation of the joints), injury, or other diseases of the joint can damage this protective layer of cartilage, causing extreme pain and difficulty in performing daily activities. Your doctor may recommend surgery if non-surgical treatment options have failed to relieve the symptoms. Total knee replacement surgery is commonly indicated for severe osteoarthritis of the knee. Osteoarthritis is the most common form of knee arthritis in which the joint cartilage gradually wears away. It often affects older people. In a normal joint, articular cartilage allows for smooth movement within the joint, whereas in an arthritic knee the cartilage itself becomes thinner or completely absent. In addition, the bones become thicker around the edges of the joint and may form bony “spurs”. All of these factors can cause pain and restricted range of motion in the joint. Severe knee pain which limits your daily activities (such as walking, getting up from a chair or climbing stairs). Moderate to severe pain that occurs during rest or awakens you at night. Failure to obtain pain relief from medications, injections, physical therapy, or other conservative treatments. Your doctor will diagnose osteoarthritis based on the medical history, physical examination, and X-rays. X-rays typically show a narrowing of the joint space in the arthritic knee. The goal of total knee replacement surgery is to relieve pain and restore the alignment and function of your knee. The surgery is performed under spinal or general anesthesia. Your surgeon will make an incision in the skin over the affected knee to expose the knee joint. Then the damaged portions of the femur bone are cut at appropriate angles using specialized jigs. The femoral component is attached to the end of the femur with or without bone cement. The surgeon then cuts or shaves the damaged area of the tibia (shinbone) and the cartilage. This removes the deformed part of the bone and any bony growths, as well as creates a smooth surface on which the implants can be attached. Next, the tibial component is secured to the end of the bone with bone cement or screws. Your surgeon will place a plastic piece called an articular surface between the implants to provide a smooth gliding surface for movement. This plastic insert will support the body’s weight and allow the femur to move over the tibia, similar to the original meniscus cartilage. The femur and the tibia with the new components are then put together to form the new knee joint. To make sure the patella (knee cap) glides smoothly over the new artificial knee, its rear surface is also prepared to receive a plastic component. 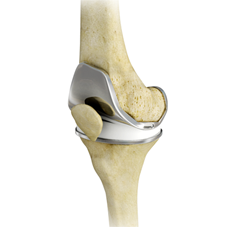 With all the new components in place, the knee joint is tested through its range of motion. The entire joint is then irrigated and cleaned with a sterile solution. The incision is carefully closed, drains are inserted and a sterile dressing is placed over the incision. Rehabilitation begins immediately following the surgery. A physical therapist will teach you specific exercises to strengthen your leg and restore knee movement. Knee immobilizers are used to stabilize the knee. You will be able to walk with crutches or a walker. A continuous passive motion (CPM) machine can be used to move the knee joint . Continuous passive motion is a device attached to the treated leg which constantly moves the joint through a controlled range of motion, while the patient relaxes. Your physical therapist will also provide you with a home exercise program to strengthen thigh and calf muscles. If you find difficulty in performing simple activities such as walking or climbing stairs because of your severe arthritic knee pain, then total knee replacement may be an option for you. It is a safe and effective procedure to relieve pain, correct leg deformity, and help you resume your normal activities of daily living. For those patients that have two painful arthritic knees replacing both at the same time may be the best option. When both knees require reconstructive surgery to overcome painful unsteady ambulation, your surgeon may recommend simultaneous bilateral knee replacement. That is having both knees replaced at the same time under one anesthetic and one stent of physical therapy to rehabilitate full function in both knees at the same time. It is not twice the pain but it is half the time to full recovery. 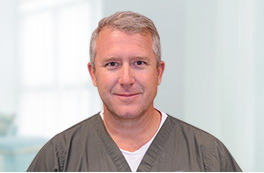 Over the last 15 years Dr Sikes and Dr Stonnington have refined the process by working together to lead two surgical teams in an orchestrated process of precision surgery such that both total knee replacements are completed in a rapid manner. Our skilled therapist will coach this specially selected patient group to begin walking with a walker within hours after surgery. The refined pathways of care including careful pre-op medical review, two surgeon cooperation, rapid surgical time, and multimodal pain management have made this group a particularly satisfying success story. The amazingly successful results for these double knee replacement patients is a documented quality outcome that contradicts some poor outcomes reported in the orthopedic literature of decades’ past. To consider having both knees replaced may be an opportunity at a total victory rather than just solving half the problem and being forced to complete the process again.